In an Australian accent, those were the words said to me across a table at a coffee shop where I lived in Glasgow, Scotland. It was 2001 and I had been living there surrounded by a culture of those who didn’t know Christ. What did I do to make this guy hate me? I was casual friends with this person and had no serious interaction with him previous to this. But there was something I apparently did wrong. Or did I do something right? I tend to avoid conflict and be a harmonizer whenever possible. So when I heard the words “hate” and “you” in the same sentence directed at me, it definitely hurt. I am led to believe a lie that just because I have gotten on my knees to accept Christ, things will be easier. Life has only gotten harder but my faith and peace in Christ has grown stronger. I was reminded this morning when reading Jesus’ words in John 15: 20 “….If they persecuted me, they will persecute you also.” Persecution should be expected. After all, the early church was hated by the world because they didn’t understand the truth. Most of this hate surrounded by the fear of the unknown. It was good, though. Most of the conflict I encounter today is with other Christians. The themes around that conflict is usually about pride. I bet if someone who doesn’t know Christ would observe the way we act, he or she would have every right to say “I hate you.” But you know what? That person is probably not caring because we as Christians become irrelevant when we fight amongst ourselves. The goal isn’t to go out and try to get people hating you. It is about being bold in your faith fearlessly sharing the Gospel. This happens by earning the right to be heard and letting the truth speak. Being hated by this guy woke me up. It reminded me that if I’m not causing a stir then I’m not quite living out the true Gospel. May you cause a stir with me. For years this moment kind of haunted me, mainly because I didn’t understand it completely. Today, God reminded me of why we as Christians are here. This is my command: Love each other. What is your “motive” in life? I love watching legal dramas, especially in movies. Most arguments by the defense come down to proving one thing, a person’s motive. 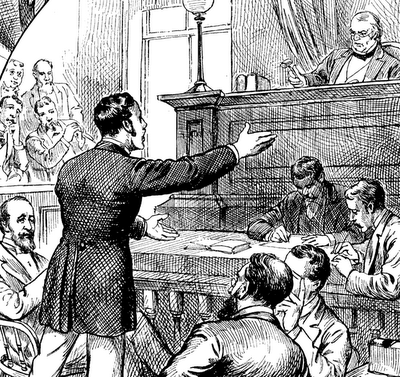 A case rests on proving a defendant’s motive to commit a crime. It is hard sometimes to prove in a court of law but the drama of understanding someone’s emotions leading into actions is powerful to watch unfold. Whether it is A Few Good Men, A Time To Kill, or To Kill A Mockingbird, motive is all that matters in court. Motive is all about the “reason” we do what we do, positively or negatively. I hadn’t really thought about what this meant to me until reading this passage. It made me more aware that I can’t fool God. I can fool others and even myself but ultimately God knows what I am really up to whether good or bad. Am I really giving “decisions” in life to the Lord? What is my motive for the way I treated that person at work today? What is my motive for asking someone to help me do something? Did I say something about myself that gave the listeners a better view of me? Did I tell the joke just so people would laugh and think I’m a funny guy? Why? Well, every day my motive is in question. I am a phony, poser, fake, etc. until I come to terms with this. Ask yourself the hard questions about the motive behind why you do what you do. Give permission to your trusted friends to question your motive if they don’t already. Don’t fool yourself because God knows what is truly in your heart. The good news in Proverbs comes in the next verse. My challenge is to go to God with my motive to truly understand it. If you don’t completely understand it, pray. By trying to understand it, I give it to Him. Ultimately God will lead me on the path that He desires. His path is greater than mine. His story is bigger than mine. I have learned that God brings out the best in us when we give our motive to him. Give it to Him and may your “motive” be genuine, honorable, and committed to the Lord. His plans will be yours and they will be great.